It’s a cliché thing to say but it’s true, blood is thicker than water. You can pick your friends but family is for life. If you are fortunate to be born into a family with a good structure and a tight bond, it sets you on the right path no matter what circumstances you face. Siblings, in particular, can have the effect on each other’s life – especially when you’re the eldest, such is the case with these two brothers from Rio de Janerio. 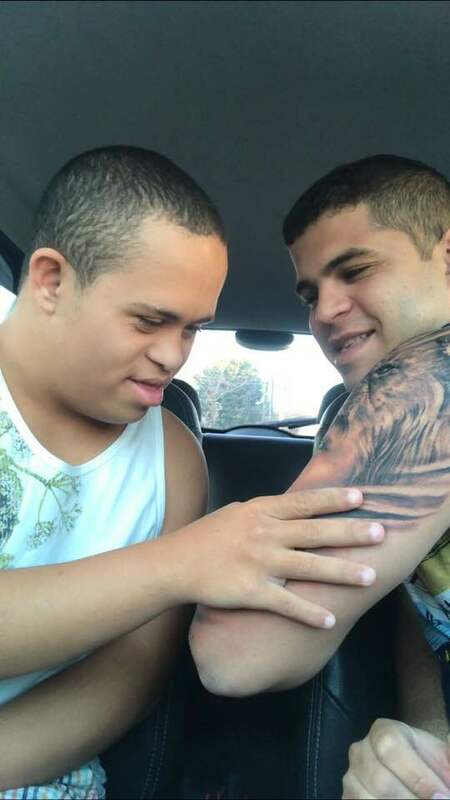 These guys charmed the internet after the elder sibling showed the younger his latest tattoo, which happens to be him wearing a lion’s head. It’s easy to picture most siblings at each other’s throats as they wage the never-ending war for domestic dominance and to see ‘who mum and dad loves best’. But this footage of Rafa showing his younger brother Erick, who has Down’s syndrome, will make you want to release your brother from that sleeper hold and hug him instead. The pictures and video was taken by the boy’s mother, Soares Sheila, and uploaded to Facebook. In the caption, she wrote of her utter joy at her eldest son’s from-the-heart-gesture for his little brother. As Erick takes in every detail of Rafa’s incredible tattoo you can see the sheer happiness and joy on his face. It clearly means a lot to him as they share a tender embrace and moment of brotherly affection. Look at my puppy’s reaction to the beautiful tribute, his face tattooed inside a lion’s mouth. The video is EXCITING. That’s why I saw Rafa asking Erick to make brave face. My dear friends, when I posted this video I could swear that it would not cause this dimension of sharing that caused. THIS IS CALLED GOD. Because he was the cause of the success of this video, because contrary to what many people think, I have never had anything easy in this life, only US and GOD and the closest friends know well what I’ve already spent in life so Erick is here with us. Out many battles, many approvals, many fights, many defeats, and many victories, but I never gave up on my children. And I won. Do you know why? Because God exists yes, just have faith, perseverance and believe that one day everything will solve. I swear to all of you that my intention when I posted this video was just to show one more of their episodes. Many thanks to all the friends who shared the video of my children, I want to thank you from the bottom of my heart to all you guys. I’ll be honest 2018 has been rather incredulous for tattoos, half the time a rapper is tattooing his face or some poor unwitting soul has got the dreaded ‘No Regerts’ tattoo on their arm. So it’s good to see a tattoo story which pulls at our heart strings.